A scent to inspire confidence and creativity, this Eau de Parfum is made from 100% natural ingredients from quality botanical sources. Fresh and fruity to lively and sweet, this light citrus scent combines uplifting greens on a smooth raspberry accord. Designed with nature, this perfume evolves with your skin, changing over time to bring out the subtle qualities of your own personal scent. 30ml. 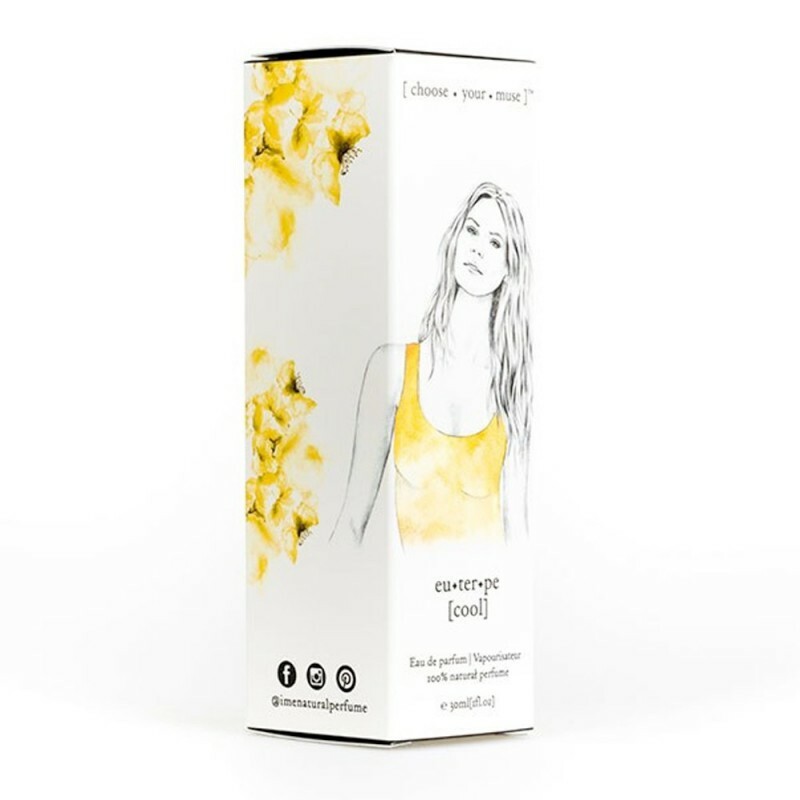 Whether you are simply looking to finally replace your mainstream fragrance with a less toxic one or needing inspiration to help make those little changes in your day to day life, then IME have created this experience for you. With a background in natural therapies and together with a master perfumer, each natural fragrance has been created holistically by Tonia, so you can choose by muse, by mood, by colour or scent. Officially certified 100% Natural by the Natural Perfumers Guild (NPG). With the highest standards for certification, the Guild is the only international organisation dedicated to 100% natural perfume. Officially accredited by Choose Cruelty Free Australia. Certified Toxin-free with Safe Cosmetics Australia. Mood inspired: Cool, Confident, Creative. "The muse of Music and Lyric poetry is confident and sassy. She will move you to discover and create the melodic soundtrack to your life on a daily basis. Live life the way you want – cool, confident & creative." Pure and gentle alcohol (grain or cane) base from locally produced Australian sources (Gluten & GMO free). This perfume evolves with your skin, changing over time to bring out the subtle qualities of your own personal scent. Wears for approx 4 hours, but varies person to person. Carefully constructed top, middle and base notes. Ingredients sourced from flowers, grasses, herbs, spices, bark, buds and more. Pure alcohol (grain, un-denatured, Gluten & GMO free) with inspired notes: bergamot, lemon, amyris, neroli, lavandin, lavender, lime, geranium, grapefruit, lemon myrtle, mandarin, spearmint, natural raspberry accord. Glass bottle can be recycled, wooden lid disassembled and returned to the earth and plastic components returned to Biome for recycling with Terracycle.